The MT40W wide angle 1D barcode scan engine not only delivers high-speed scanning but also provides versatility needed in various applications. 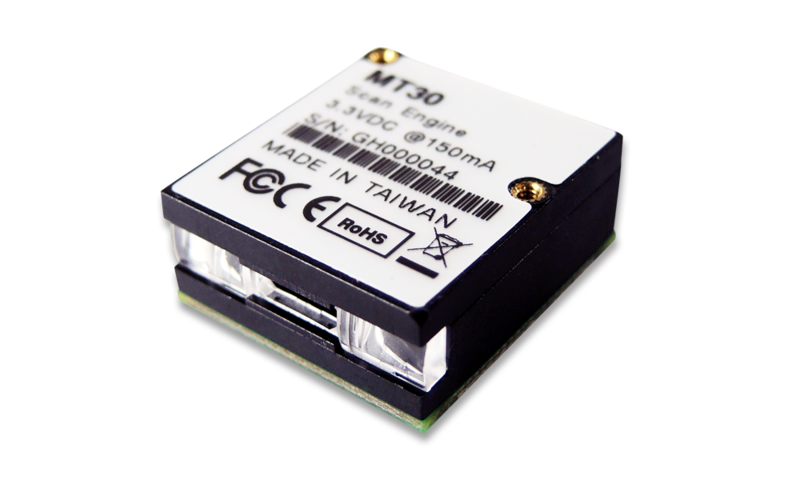 MT40W operates with a wide range of input voltage from 3.3V to 5V and blends powerful scanning performance for portable and fixed devices applications. With 65 degrees of scan angle, which is the largest in the industry, MT40W is capable of scanning the widest barcode at the nearest distance. As a result MT40W is suitable to be integrated into ticket machine or coffee machine with very limited reading distance in a constraint space. MT40W, with enhanced optical design and latest decode algorithm, virtually scans all 1D barcodes on any surface, either paper-based label or mobile phone display. With MT40 wide angle scan engine integrated into mobile device, users may expand their business into many new applications such as eCoupon, eTicket, Digital ID cards and mobile payments. MT40W wide angle scan engine enhances design flexibility by offering various output interfaces with USB HID,USB VCP and UART and enabling the user to easily configure the reading modes and scanner settings according to preference. 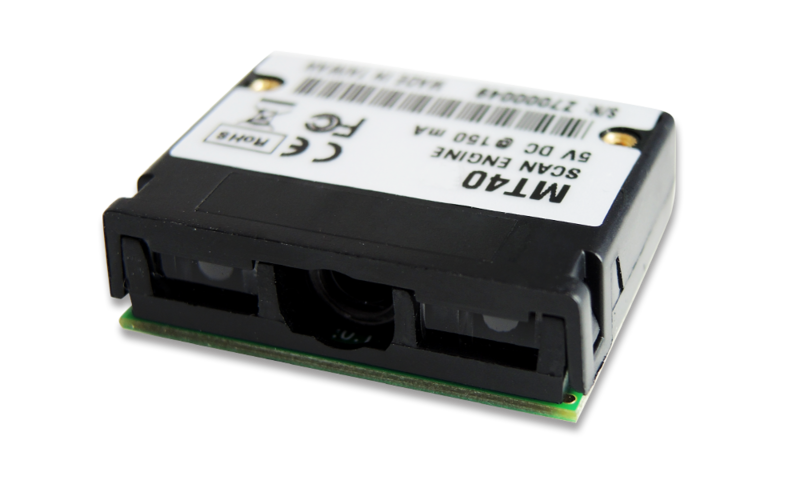 The flash memory of MT40W serves as a flexible and upgradeable provision for additional requirements or performance enhancement and extends the product's lifecycle as well. MT40W wide angle scan engine automatically adjusts its parameters for optimal scanning performance which provides the freedom to scan barcodes from under complete darkness to direct sunlight. With configurable scan rate between auto-adaptive mode and fixed mode, MT40W is ideal for both high-speed scanning applications and smart devices which require more motion tolerance and ambient light immunity. A set of commands is supported to enable the host device to configure all the functions of MT40W wide angle scan engine thereby fulfilling dynamic configurations demand. To help user grasp and understand the bi-directional communication more quickly, the Windows®-based BEO® configuration utility is provided as a user-friendly platform where testing MT40W can be done in a much easier way. MB100 Demo Kit (sold separately) provides the software and hardware tools required for testing MT40W wide angle scan engine before integrating it into the host device. The kit contains software utility, interface cables and MB100 Multi I/O board. 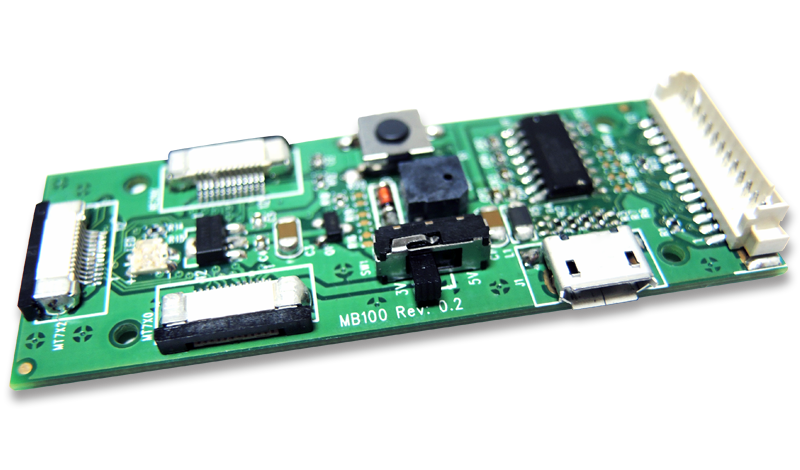 Due to its small size, MB100 is also suitable for being installed inside the host system as an interface board connecting MT40W to the host device.